No Collector in Guardians of the Galaxy 2? In just a few weeks, director James Gunn will start production on Marvel's Phase Three sequel Guardians of the Galaxy Vol. 2, with principal photography set to begin in Atlanta next month. The Guardians of the Galaxy themselves, Star-Lord (Chris Pratt), Gamora (Zoe Saldana), Drax the Destroyer (Dave Bautista), Groot (Vin Diesel) and Rocket Raccoon (Bradley Cooper) are all set to return, with Pom Klementieff coming aboard as the first new cast member, rumored to be playing Mantis. 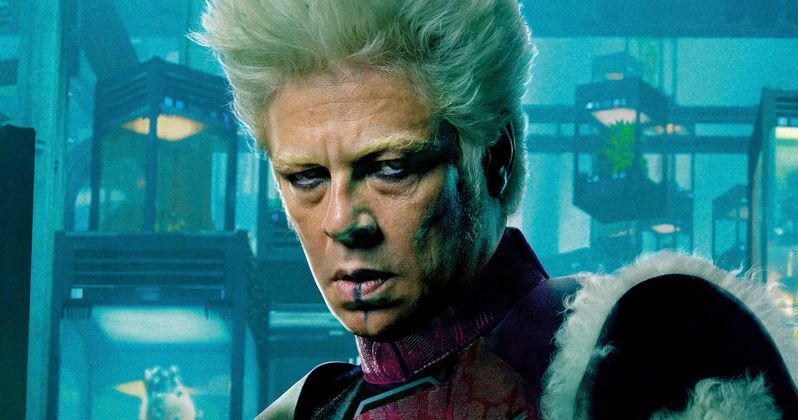 While no other cast members have been confirmed at this time, original Guardians of the Galaxy star Benicio Del Toro revealed in an interview with ComingSoon.net that he won't be returning as The Collector. "I don't think so. They would have told me, I hope... I do hope to play that character again at some point." While the news may be disappointing to fans of The Collector, it's possible that he could return, especially since his character may play an important part in the build-up to Avengers: Infinity War Part I and Avengers: Infinity War - Part II. It was revealed in a post-credits scene of Thor: The Dark World that The Collector was given the Aether, a.k.a. The Reality Stone. Since this is one of the Infinity Stones that Thanos (Josh Brolin) is trying to collect, it seems likely that we could see him again at some point. As for his involvement, or lack thereof, in Guardians of the Galaxy Vol. 2, that may be due to a scheduling conflict. The actor is attached to star in Star Wars: Episode VIII, which is scheduled to start production at Pinewood Studios in London later this month. Benicio Del Toro teased in September that he won't start production until March. With Guardians of the Galaxy Vol. 2 starting principal photography in February, there likely won't be time for the actor to put in an appearance, and, as the actor said, he surely would have heard something by now. So while we shouldn't expect to see The Collector in Guardians of the Galaxy Vol. 2, it's still possible he will return to the MCU at some point. We reported last month that Kurt Russell is in talks to play Star-Lord's father in Guardians of the Galaxy Vol. 2, but his casting has not been confirmed. Writer-director James Gunn has teased in the past that the sequel will reveal who Star-Lord's father is, and while he wouldn't confirm that character's identity, he did say that it wouldn't be the same character from the comics, J'son. Kurt Russell did confirm that he was approached to star in the sequel, but he has to watch the original movie first and read the script for the sequel before he decides. Director James Gunn also revealed today that he was discussing giving a cameo role to David Bowie in Guardians of the Galaxy Vol. 2, before the iconic singer passed away last night at the age of 69. The filmmaker also added that he originally planned on using another one of David Bowie's songs on the sequel's soundtrack. While the scene he had planned on using the song in was cut from the script, the director did add that they have the rights to this song, and it still may be used in some way. Are you disappointed that The Collector will not return in Guardians of the Galaxy Vol. 2?